Today, we were honored to be the featured performers for the Christ United Methodist Church service. We performed three pieces: Air from Handel's Water Music Suite, Coventry Carol, and Ave Maria by Schubert. It was a pleasure to play for a full congregation of enthusiastic parishioners. We were reminded of the goodness of people of all faiths. We felt united by the wish of all people for peace, hope, and love in this world. We were invited by Ed Duncan, the church organist, who taught AP Physics to violinist Meili Bell for 3 formative years at Cottonwood High School. Fellow Cottonwood Colt and regular Strings of Elegance sub, Brittany Gardener, took Anna's place on the cello for this special event. Posted on December 31, 2017 by Strings of Elegance and tagged Church Services Celebrations New Years. In July in Utah, it is always a good idea to head up the canyon for some relief from the heat. This happy couple joined hands on the Creekside Terrace Patio at Snowbird Resort. We played for the ceremony and the cocktail hour, where we stole glances at this spectacular mountain reflection in between pieces. Posted on July 16, 2017 by Michelle Pierce. We absolutely loved playing for Cassidy and McCallan's wedding at Red Butte Garden. It was a gorgeous day. Their wedding cake was made out of waffles. Cassidy's dress was so romantic. The love among the guests was palpable. And Wayne Sermon, the lead guitarist from Imagine Dragons, officiated the wedding! He was lovely to work with, as were the bride, groom, and their parents. It was just a happy, peaceful celebration in every way. Posted on June 1, 2017 by Michelle Pierce. The officiant at the wedding at High West Refectory at Blue Sky Ranch was the funniest we've ever heard. He had the wedding guests and the bride and groom rolling with laughter! This was perhaps the windiest wedding we've ever played as well. Thank goodness for clothespins that keep our music stable, but even with this advanced technology, strong wind gusts blew our binders closed a few times. Thankfully, we have been playing together long enough that we can get through the last few bars of most of our repertoire without the music. We played for about an hour in the frigid wind as guests mingled inside and out. Then guests gathered in the garden under a vivid blue sky to await the ceremony. Perhaps my favorite part of the wedding was when, instead of a formal processional, the bride and groom casually walked out together as we played La Vie En Rose. We enjoyed the happy ceremony, and were then relieved to move inside for another hour of celebration. Posted on May 25, 2017 by Michelle Pierce. Anna and John probably imagined a sunny spring day in the Fragrance Garden when they chose Red Butte Garden for their wedding venue. But the rain arrived as we were setting up and didn't let up. After moving ourselves and our instruments back into the lobby, we ran back out in a golf cart to retrieve the rest of our gear. And we waited. And waited. But the rain was relentless. 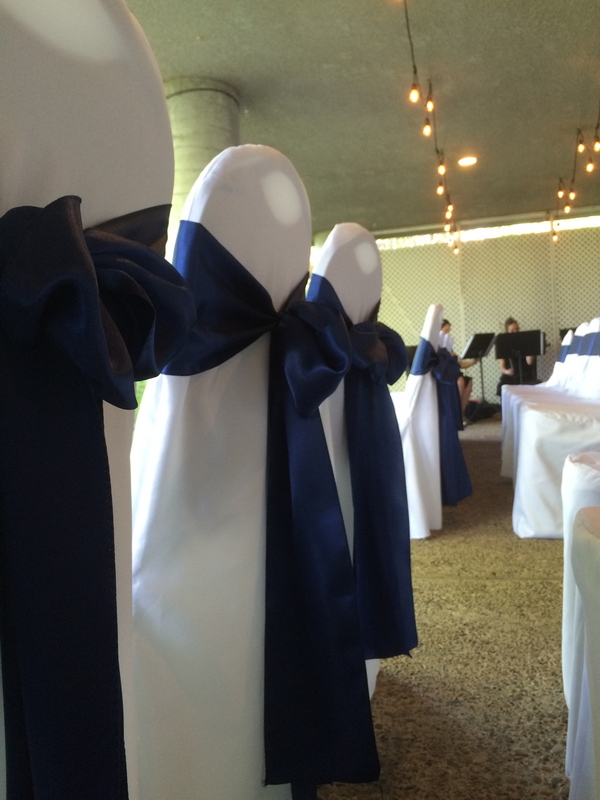 It was finally decided that the ceremony would take place inside the Orangerie. Anna and John are both science students; the teacher that introduced them officiated the wedding! It was nerdy in the best possible way. As a math nerd myself, I feel a true affinity for fellow nerds. It was also romantic. Through the changes and assumed disappointments, everyone was all smiles. And just as the lunch wrapped up, the sun broke through the clouds (could it be because we played Here Comes The Sun?) and the wedding party was able to roam the garden for their wedding photos. Posted on May 21, 2017 by Michelle Pierce. We were so happy and honored to be invited to provide festive party music for Janet's 60th birthday party! Because it was a backyard affair complete with bounce house for the grandkids, we opted to dress down a bit in black and white instead of our usual formal black. Funny how exciting that was for us! We performed some happy classical pieces, as Janet is a fan of classical music. Then we spiced things up with Don't Stop Believin', Sweet Home Alabama, Moon River, When I'm Sixty-Four, and the birthday girl's favorite, The Prayer. Posted on May 20, 2017 by Michelle Pierce. Posted on May 8, 2017 by Michelle Pierce. We play Christmas music! We were honored to be invited to perform at the Treeo Christmas party earlier this month. We played selections from The Nutcracker and traditional Christmas carols, to which some residents sang along. Merry Christmas, Happy Holidays, and warm wishes to you! Posted on December 20, 2016 by Michelle Pierce and tagged String Quartet Utah String Quartet Treeo Christmas Music Christmas Quartet.